Byron Mallott resigned suddenly Tuesday as lieutenant governor, citing “inappropriate comments” he recently made. 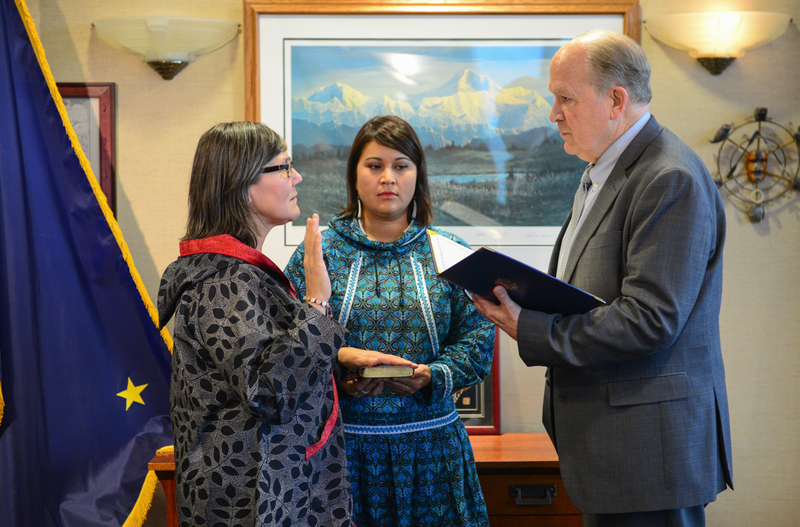 State Health and Social Services Commissioner Valerie Nurr’araaluk Davidson was sworn in to replace Mallott during a private ceremony in Gov. Bill Walker’s Anchorage office Tuesday afternoon. The administration held an emergency cabinet meeting. Mallott also resigned from the campaign for a new term on a ticket with Gov. Bill Walker. It’s too late to remove Mallott’s name from the ballot, but the campaign said Davidson would also serve as lieutenant governor if Walker is re-elected. Walker has been close to Mallott and he has spoken frequently about their collaboration. But Walker emphasized the seriousness of the matter. “As leaders, we really need to hold ourselves with the highest standards, and … that was not the case,” Walker said. Walker did speak to members of the press later outside a fundraiser for the Alaska Native Justice Center. There, Walker declined to specify the nature of the comments, saying he didn’t want to jeopardize the victim’s wish to avoid being identified. Walker said he learned of the comments Monday afternoon, and after discussions, Mallott tendered his resignation on Tuesday. When Walker was asked if he had considered suspending his re-election campaign, he was unequivocal. “No, I didn’t … all I said was I’d much rather focus on what we do while we’re here than how long we’re going to be here,” he said. The lieutenant governor oversees elections and has few other official duties. But Mallott has been unusually visible in the role. He was the Democratic nominee for governor four years ago, before he merged his campaign with Walker’s. In his resignation letter, Mallott said his resignation was “compelled by inappropriate comments I made that placed a person whom I respect and revere in a position of vulnerability.” He did not say who he was referring to. Mallott wrote in the letter that he takes full responsibility for this action and apologizes to the person he said he hurt. Mallott told Walker in the letter that he recognizes that his actions have compromised Walker’s ability to lead the state. “For that I also express my remorse and sorrow,” he wrote. Mallott, 75, is from Yakutat. He became mayor of the city when he was 22. He is a clan leader of the Tlingit Raven Kwaash Kee Kwaan clan. He was president of the Alaska Federation of Natives and the First Alaskans Institute, and chair and executive director of the Alaska Permanent Fund Corporation. Davidson has led the Department of Health and Social Services since the beginning of Walker’s administration. She grew up in Bethel and Aniak. Republican candidate for governor Mike Dunleavy said in a statement that his campaign “remains focused on restoring trust in state government.” Democratic candidate Mark Begich couldn’t immediately be reached for comment. Zachariah Hughes in Anchorage and Jeremy Hsieh in Juneau contributed to this story.